Do you love steel-cut oatmeal, but not how long it takes to cook? Make this overnight steel-cut oatmeal for a quick breakfast in the morning. Do you love steel-cut oatmeal, but not how long it takes to cook? 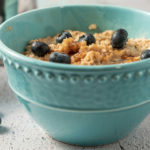 Make this overnight steel-cut oatmeal for a quick breakfast in the morning.